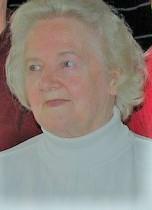 Family and friends will gather to remember Mary Ellen Murphy, 87, of Milwaukee from 1-4 p.m. Sunday, May 6, at Tullar Park Memorial Shelter in Neenah. She died April 23, 2018, at Columbia St. Mary’s Hospital in Milwaukee after an illness. Mary Ellen was born Feb. 4, 1931, in Appleton to Henry and Erna Samson. She married John J. Murphy in 1948 and they resided in Appleton until moving to the Town of Menasha in 1957, and then to Neenah in 1966. She moved to Milwaukee in 2001. She and John raised eight children. Mary Ellen was a devoted mother and homemaker. She was an avid reader, a lover of horses and large dogs, and an exceptional cook. Once, after her oven had malfunctioned, she roasted a Thanksgiving Day turkey in her living room fireplace. She cooked for many years at Theda Clark Memorial Hospital in Neenah. In her later years, she and her daughter Sharon celebrated St. Patrick’s Day by preparing elaborate feasts for family, friends and patrons of Regano’s Roman Coin tavern in Milwaukee. She was preceded in death by her parents, her husband John, her daughter Shelagh, her sister Jeannette and her brother George. Survivors include her children: Sharon, John and James, all of Milwaukee, Henry of San Antonio, Texas, Daniel (Peggy) of Appleton, Patrick of Edina, Minn., and Sean (Peggy) of the Town of Fox Crossing; her grandchildren: Gwenyth, Megan, Angelica, Tierney, Elise, Tessa, Andrew, Lauren, Ryan and Shavaughn; three great-grandchildren, Tyler, Axel and Mackenzie; and her sister, Margaret of Neenah. The family suggests memorials to a favorite cause or charity.